I have no intention of relying on phone photography here, but I am a bit in love with this shot. It wasn't my plan on sharing this recipe either, as snapping the pic was a spontaneous thing, and the recipe was a bit thrown together, in the aim to perfect a birthday wish. But we'll get to that. First, to explain. My freezer storage is divided into three distinct, but unequal zones. The largest is ingredient storage. It's where I keep nuts and grains, plus seeds and cacao nibs, and things like wheat germ and bran. Flours and shredded coconut. There's fruit from the summer stacked in flat packs, and bananas black-ripe and ready for bread. Ginger root I grate while still rock hard, chiles, and lime leaves. I am rarely without frozen spinach and sweet peas. The smallest category is full of odds and ends; ice cubes, egg whites, and parmesan rinds. A package of homemade puff pastry, unbaked streusel from when I made too much, discs of pie dough, and bones for stock. Between the two are the prepared leftovers. There is enough tomato sauce for one pizza, cooked rice, some savoury hand pies, Julia's turkey meatballs, and cakes. A lot of cake. It's not just that the pace of our consumption rarely keeps up with the celebrations around here. It's also one of those rarely-discussed byproducts of recipe testing. The spoils are regularly parcelled for giving away, but a small stash is always kept behind. Right now, my inventory includes the thinnest slice of walnut cake from Divali, a quarter of a vanilla bean cheesecake, bagged muffins, a coffeecake that's a work in progress, and s'mores brownies. Those brownies though, they're celebratory through and through. Benjamin turned 11 in January. He's all knees and elbows now, and has strong opinions. He's had a thing for s'mores for years, and this birthday wasn't any different. 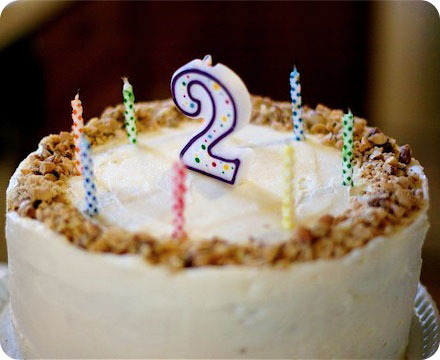 He asked for a repeat of last year, brownies with chocolate ganache and a seven-minute frosting to billow on top. When I've made s'mores cupcakes in the past, the inclusion of graham crackers added essential contrast against all the dense-chocolate-marshmallowyness going on. I like them as rebar in the ganache rather than rubble in the brownie itself. Somehow they make more of an impact that way. Toasting the grahams in the oven crisps them up, the process and effect amped up with a sugar syrup glaze. I use my own brownie recipe, but as it was included as a preorder inclusive for my book, I made the squares this week with another favourite, from King Arthur Flour. As advertised, their brownies exist ideally between squidge and cake. You can use my recipe, if you have it, or theirs, or your preferred. One thing I'll say though, is resist the urge to use an intensely fudgey one. When combined with the ganache and the meringue frosting, it is a combination that can careen into headache-inducing real quick. The brownies are over the top. They bring out the childlike and exuberant, and are the antithesis of refined. They are unbridled and unrestrained, and remind me of the happiest days. Don't let the fact that there were leftovers steer you into thinking they went unloved. Sometimes, you want to make the good things last. And, as brownies never fully freeze, a skinny slice on a Monday midmorning with coffee, falls into that category. For the record, that was exactly what I was planning when I took the photo. The brownie recipe is this recipe from King Arthur Flour, halved. The marshmallow frosting owes it loft and stability to Stella Park's revolutionary Easy Swiss Meringue. Make the brownies. Preheat an oven to 325°F | 165°C. Lightly grease an 8-inch square baking tin, then line with a piece of parchment paper with a 1-inch overhang. Press the paper into the pan and then remove. Line the pan with another piece of parchment paper, then place the first piece, buttered side up, across. Set aside. Crack the eggs into a bowl. Sift in the cocoa, baking powder, espresso powder, and salt. Add the vanilla. Beat for four minutes on medium speed (you can do this while melting the butter in the next step). Place the remaining butter in a medium saucepan. Pour in the sugar. Heat over medium low, stirring, until the butter is melted. Continue to cook until the mixture is hot but not bubbling, maybe 1 minute more. It should go shinier as it heats. Stir the hot butter and sugar mixture into the beaten eggs until smooth. Sift the flour over top and mix it in. Spread the batter into the baking dish, nudging it to the edges as needed. Bake until the top begins to crack, 32 to 35 minutes or so. Cool on a wire rack. While that bakes, make the graham crunch and ganache. Line a rimmed baking sheet with parchment paper. In a small, heavy bottomed saucepan, dissolve the sugar into the water. Bring to a boil over medium heat then simmer for 5 minutes. Brush both sides of the graham crackers with the syrup then arrange on the prepared baking sheet (there will be syrup left over. Save it as a sweetener for coffee, oatmeal, or fruit). Bake the crackers until toasted, 8 to 10 minutes, flipping once. Set aside to cool then snap into pieces, some small, some large bite-sized. Tumble the chopped chocolate, espresso powder, and salt in a large heatproof bowl. Heat the cream in a medium, heavy-bottomed saucepan. Once steaming, pour the cream over the chocolate and let stand 5 minutes, undisturbed. After the time is up, stir until smooth, starting at the centre of the bowl and working outwards. Fold in the graham crunch. Pour the rubbled ganache over the brownies and spread to an even layer. Cool to room temperature, then refrigerate until set. Finally, make the frosting. In the bowl of a stand mixer, stir together the egg whites, sugar, cream of tartar, and salt. Set the bowl over a saucepan of simmering water, making sure that the bowl has some clearance. Heat, stirring attentively and scraping down the sides of the bowl periodically with a silicone spatula, until the mixture reaches 175°F | 80°C on a candy thermometer, about 8 minutes. Transfer the whites to the stand mixer with the wire whisk attached. Beat, starting slow and increasing the speed steadily, until the mixer is on full. Whip until the stiff, glossy peaks form, 5 to 7 minutes. Stir in the vanilla. Retrieve the brownies from the fridge. Spoon the frosting onto the ganache layer. Use an offset spatula or the back of a spoon to swoop and swirl it to your liking. Toast the frosting with a culinary torch or under a hot broiler—watching it all the while. Let cool and set, then use the cross of parchment to lift the brownies from the pan, then slice and serve. Extras can be refrigerated in their pan, loosely covered with cling film, for 2 days. Or, frozen until firm and then transferred to an airtight container for freezer storage up to a month. I also really like Jenny Rosenstrach's brownies from her book How to Celebrate Everyting: Recipes and Rituals for Birthdays, Holidays, Family Dinners, and Every Day In Between (Ballantine, 2016). You'll find them on page 95. They are one of me most-perfectly textured brownies I've ever had. They are slightly thinner than my brownies, which is why I went for the King Arthur for those looking to replicate the look of the photo. To change this place was not something I found easy. I can be a homebody to a devoted degree, and had little inclination to renovate a space I considered a home into something altogether unfamiliar. But then an external push came that necessitated a move, and in that not-so-gentle nudge I found the inspiration to move the furniture around, to find a new perspective for this room. It has been almost five years. Yes, five whole years come May 1, 2010. Today is the 1,115th day, if my math is correct (it probably isn't). And so, here it is. I baked this cake this weekend, to celebrate some birthdays. I was pretty happy with how it turned out, and I think I'm pretty happy with how this all has turned out as well. I hope you like it here, too. Thank you for stopping by. It seems some readers are picking up new posts, and others aren't. If you'd like to try to subscribe anew, there is a link just there on the left sidebar. My apologies for any trouble! And one more thing, since it's too much of a looker not to mention, the cake plate above is from Herriott Grace. Thanks to my sis-in-law Rene, for not only hosting the dinner tonight, but also being our photographer. She's especially snazzy. I know, we were chatting about chocolate and coffee just a few days ago. And it seems as though I have had sweets on the brain for weeks now. But, if ever was there a day when maybe, just maybe dear reader, you could cut me some slack for my repetitive ways, I hope it will be today. Because really, who would begrudge a birthday girl her chocolate wish? That's right, today was my birthday. Please excuse my sweet tooth and forgive me for being a trifle scatterbrained just now, but I wanted to stop in to share with you the dessert we chose to celebrate. Our fancy-dress festivities are not for another few days, so today is all about a night just for family. And for me, if there is one dessert that ties together my thoughts of family and nostalgia all in one ribbon-tied package, it would be my Mum's Mocha Dessert. When I was little, this Mocha Dessert was the often-requested sweet ending to my parents' dinner parties, parties I considered the height of elegance. Silver was polished to perfection, the good china was brought out, and the menu were planned days in advance. When the night arrived, the men were dapper and the ladies were always dressed to the nines; you can surely imagine how my six-year-old self loved the glamour of dark lipstick and dangling baubles. I remember their conversations lasting into the night. The deep murmur of their voices, often punctuated by peals of sparkling laughter, made its way through the darkness, up the stairs and to my ears as I strained to catch what was surely exceptionally witty banter. I thought it all terribly romantic. As an adult, I can appreciate why this simple recipe was the subject of such praise. 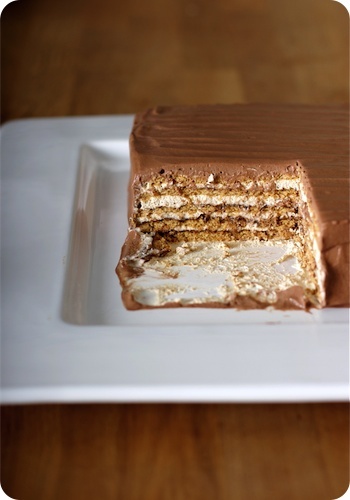 Layers of graham crackers were sandwiched with coffee cream and drizzled with chocolate sauce. After a night's rest in the icebox, the formerly-disparate components relax into each other. The graham crackers loose all their crispness, the cream turns thick and luscious. In the end, everything is mousselike, with a delicate delineation of layers that yield to the slightest pressure from a spoon. 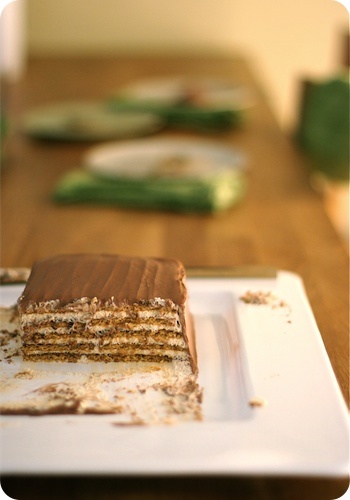 A cross between an icebox cake and a tiramisù, I strongly believe that it was this ethereal confection that started my love affair with coffee. 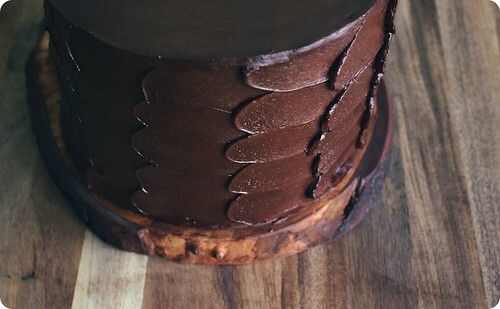 This cake is ridiculously easy to make and decidedly old school. It is not about bells and whistles, or technique and the latest trend. Instead, like all fond memories, it simply makes me smile. Of course I had a little bit of business to attend to today, and that is the announcement of the winner of the giveaway. I am happy to say that Random.org has selected Angela as the recipient of a one-year subscription to the food magazine of her choice. Angela, please contact me at tara [at] sevenspoons [dot] net with your contact information. Thank you to everyone that entered and a here's wishing a happy day to each and every one of you! Adapted, with thanks, from my Mum. Hers was made and served like a tiramisù, with more cream and less cookie, scooped out for serving. I have turned the dessert out on its head, and added some chocolate whipped cream. Line an 8-by-8-inch metal cake pan with a cross of clingfilm, leaving an overhang on all sides. Set aside. In the bowl of a stand mixer with the whisk attachment, or in a medium bowl with a hand blender or whisk, begin to whip 2 1/2 cups of well-chilled heavy cream. Once the cream begins to thicken, sift in 1/2 cup confectioner's sugar, the coffee granules and salt. With the mixer on medium-high, whip until the cream begins to hold soft peaks. Add the vanilla, and beat until the cream just holds a stiff peak. Spread a small amount of the cream on the bottom of the prepared cake pan. Lay 9 crackers, in a 3-by-3 grid, on top of the cream. Spoon 1/2 cup of the cream on top of the crackers. Then, using an offset spatula, gently spread the cream to cover the crackers entirely. Drizzle a few tablespoons of the chocolate syrup over the cream, spreading to form an even layer if desired. Top with another layer of graham crackers, continuing the layering until you have 5 layers of crackers and 4 of the cream and chocolate. Make sure to reserve a small amount of cream to cover the last layer of crackers (no chocolate on this one). Cover loosely with a piece of clingfilm, then draw the overhanging clingfilm from the sides up to cover the edges. Refrigerate for at least 6 hours and up to 2 days. About 1 hour before serving, remove the cake from the fridge and peel back the clingfilm. Invert the cake onto a serving plate, removing the remaining clingfilm from the top and sides. Smooth out the sides with an offset spatula if needed. Place the cake in the freezer, uncovered, to chill for 15-30 minutes. Prepare the cocoa cream. In the bowl of a stand mixer with the whisk attachment, or in a medium bowl with a hand blender or whisk, begin to whip the remaining 1 cup of well-chilled heavy cream. When the cream begins to thicken, sift in the reserved 1/4 cup confectioner's sugar and the cocoa powder. With the machine set to medium-high, whip the cream until it holds a firm peak, but being careful not to over beat. Take the cake out of the freezer and carefully spread a thin layer of the cocoa cream over the top and sides. Once completely covered, use any remaining cream to decorate as desired. Chill the finished cake in the refrigerator for 30 minutes, then serve. • If you are going for authenticity, my Mum used Hershey's Chocolate Syrup (the dessert topping in the yellow tin, not the brown squeeze bottle). But if you are feeling posh you can make your own using one of theserecipes. • For the sake of honesty, I will say that maybe I went a little overboard and used a full 2 cups of cream for the cocoa frosting. 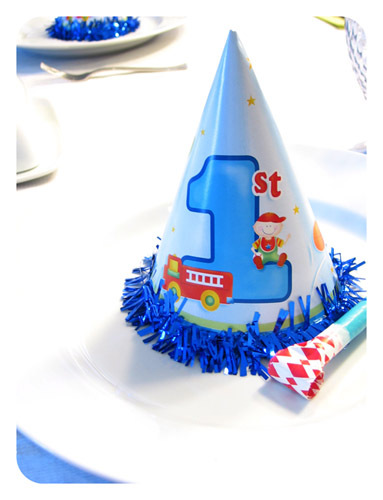 The last 1/2 cup looked so sad in its carton, and heck, you only have one birthday a year. Totally not necessary to the cake, but enjoyably decadent. To follow suit, add a bit extra cocoa powder and confectioner's sugar, to taste. 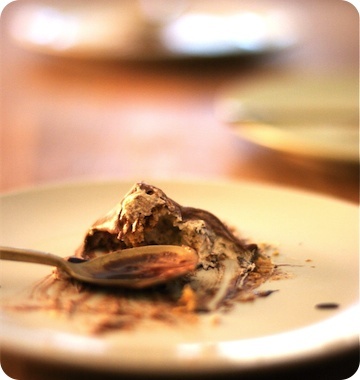 • A pinch or two of instant coffee granules added to the cocoa cream is also a good thing. Please excuse the rather plain cake plate for serving; I do believe that Mom deserves the frilliest, prettiest of cake stands, but for fear of losing it all in transport, I had to err on the side of (dowdy) sensibleness. Now with the holiday season in (almost) full swing, one might be expect to find me knee-deep in mistletoe and ornaments. And while those baubles have a place in the house these days, there are also cake pans laying about, a box of icing tips open and waiting, and some birthday candles at the ready. I am lucky enough to have both a Mum and a Mom. "Mum" is my own mother, a woman after whom I follow in many ways - our humour, our aesthetic, and our looks (though neither of us truly see it), are rather in sync. We have a shorthand version of communication, where I can simply describe a situation, often searching to find the right words, and even with those gaps she instinctively knows what I mean and how I would react; because, in truth, she'd most likely react the same way. My "Mom" is my husband Sean's mother. Coming into my life when I was already headstrong and full of opinions, she is the person who has brought me a new perspective. With distinctly different backgrounds and experiences, it is because of our divergent styles that she has shown me new avenues to expand my horizons. For instance, I never knew how much I adored Depression Glass until I saw her charming collection, and she is now the one with whom I am happy to wander antique markets and country stores. She is a quilter, whereas I come from a family of knitters; it has been her love of that art that has taught me to appreciate the details of a well-stitched piece, and the beauty in fabrics. It is with her that I have enjoyed conversations over a cup of tea, shared at a tiny table laid perfectly with china and silver and a tiered tray with filled with dainty sandwiches, delectable sweets and delicate scones with cream. She was the one with whom I bought my earrings for my wedding day. But most of all what Mom has brought into my life has been enthusiasm; whether it be for the seasons (she has a greener-than-green thumb), the holidays or her grandsons, Mom is one that is ready to embrace each one, with arms open wide. In truth, my celebratory efforts seem minimalist in comparison to hers, me with my clear lights and greenery, her with kaleidoscope of fantastic rainbow-hues and sparkles for days. Today is her birthday, and in the midst of all the snow outside my window, a winter-white cake seemed apt. Four moist layers of warmly-spiced carrot cake sandwich luscious cream cheese frosting, crowned with a delicate circle of floral-ish decorations. Charmingly vintage, I do hope Mom will approve. I originally came up with this variation on a recipe from Dorie Greenspan for our housewarming party. Mom had spoken fondly of a carrot cake from her childhood, and I was attempting to recreate it for her - happily, she said my efforts were a success. The use of both fresh and dried ginger adds another dimension of subtle, spicy heat. Preheat the oven to 325°F (160°C). Butter four 8-by-2-inch round cake pans. Dust with flour, and tap out any excess. Set aside. Into a medium bowl, sift together flour, baking powder, baking soda, spices and salt. In another medium bowl, stir together the carrots, walnuts, coconut, fresh ginger and orange zest. Set aside. In the bowl of a stand mixer with the paddle attachment, add the oil and sugars. Beat, on medium high speed, for about five minutes or until the mixture is smooth and light. Scrape down the sides of the bowl with a rubber spatula now and again. Add eggs, one at a time, beating well after each addition and scraping down sides of bowl. Reduce speed to low and add the flour mixture, blending just until all the flour is incorporated. With the mixer still on low, add the carrots and stir to combine. Divide the batter evenly between the four prepared cake pans and bake until golden and a wooden skewer inserted into the center comes out clean, about 25-30 minutes. Cool in pans on a wire rack for about 10 minutes, then turn out to cool completely (turn the cakes right side up). Smear a bit of frosting on the base of your cake plate or stand. Place one layer on the cake plate, then place four strips of parchment paper around perimeter, tucking the edges under the cake - this parchment will keep the cake plate neat. Spread between 1/4 to 1/3 of a cup of frosting over the cake (I never have measured, you are aiming for a thin, even layer), then place another cake on top. Repeat process with the next two layers and top with last remaining layer. 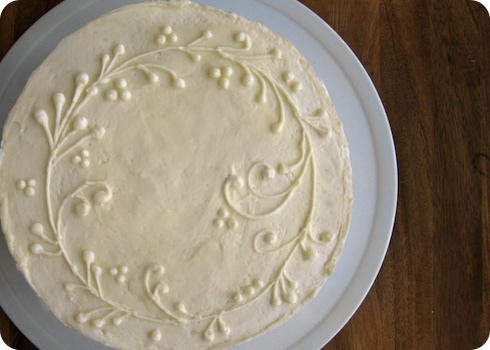 Spread top and sides of cake with thinly with frosting, forming what is called a crumb coat. It does not need to be perfect, but the cake should be completely covered so that crumbs will not migrate into the final coat. Chill for at 30 minutes or until the frosting is slightly firm to the touch. Use the remaining frosting to coat the top and sides of the cake, as desired. 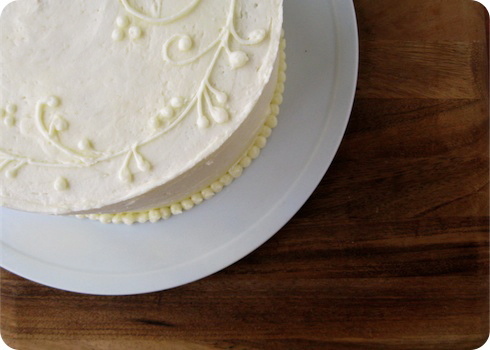 Use a thin-bladed knife to score where the frosting meets the parchment paper to break the seal, and remove. • This cake is exceedingly tender, which is why I use multiple cake pans instead of splitting the layers. You could easily use two pans to make two layers, adjusting the cooking time accordingly. • The Cream Cheese Frosting is very soft, and not the easiest to pipe. If it gets too warm, chill both the cake and frosting for about 10 minutes to firm up. Even with such measures, keep in mind that this is not the type of frosting that allows for a perfectly-smooth finish. For everyone kind enough to send birthday wishes to Benjamin, or to anyone interested, here is a peak at some of the birthday festivities. Thank you all for helping us celebrated our little man, and a special thank you to my brother for the above photograph. 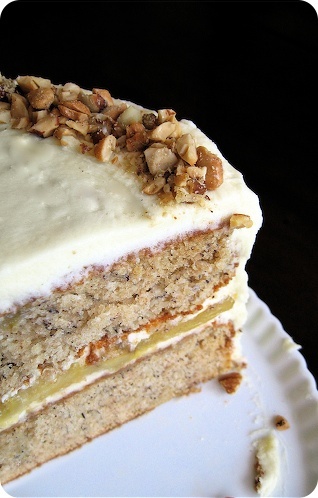 This one of Ben's three cakes; spiced banana cake layers with carmelized banana filling, topped with brown sugar cream cheese frosting and a bit of salted mixed nut crumble. Edited to add: For those interested in the recipe, the cake is a spiced variation on the banana layer cake with mascapone frosting from Martha Stewart's Baking Handbook. The frosting I use is Ina Garten's, with a bit of the icing sugar substituted for golden brown. Finally, I top it with a salted-nut praline crumble, of my own recipe. ... our lives completely changed. And for that, we could not be more thankful. Happy Birthday, bundle of boy.